The Model NECE 76-2 is a tone generator used for cable pair identification and troubleshooting of copper conductors. The Model NECE 76-2 Conductor Identification Tone Generator is designed to aid outside service personnel in cable pair maintenance and identification. The unit generates a tone of 5777.5 Hz pulsed at 7 Hz rate, easily distinguished from other call progress tones, saving time in location and repairing cable problems. Powering the unit from the office battery supply is convenient and economical. Permanently mounting the unit near the cable pairs makes for easy patching and eliminates problems encountered with portable equipment. Plugging in the patch cord power up the unit, and LED indicators display “Power On” and “Tone Output”. 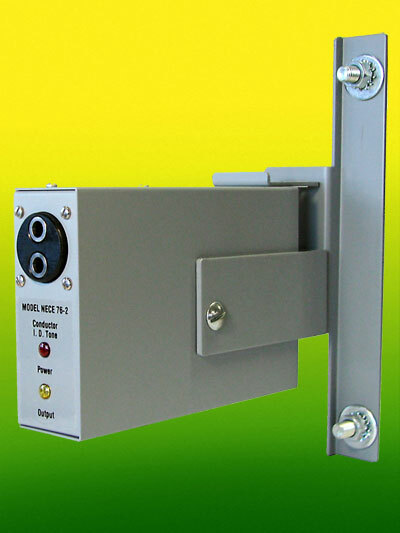 No maintenance is required and with their low initial cost, more than one NECE 76-2 Conductor Identification Generator may be convenient for some locations.